Rylance, Mark. I am Shakespeare. London: Nick Hern Books, 2012. This play contains Rylance's theory that someone else wrote the plays attributed to Shakespeare. 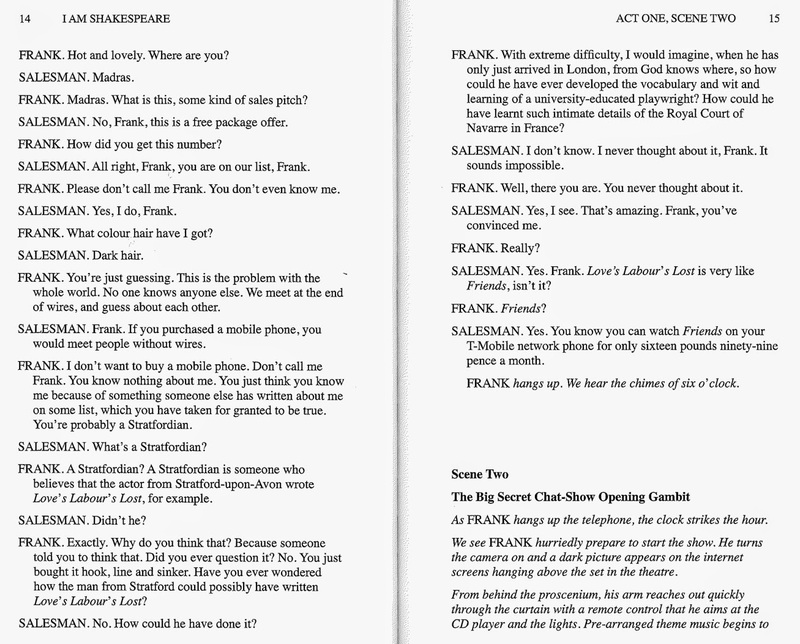 The plot is centered on a man named Frank who is putting on a web broadcast on the authorship question. He's visited by four claimants (Shakespeare, Bacon, Oxford, and Mary Herbert, née Sidney). At the end, everyone in the audience is meant to recognize that it doesn't matter who wrote the plays; they each are meant to stand up and say, "I am Shakespeare." It's a particularly frustrating play, helping to establish that propaganda very rarely makes good art. Shakespeare managed to do it in Richard III, but that play really has propagandistic elements in an artistic endeavor. This play is almost exclusively "Reasonable Doubt" propaganda. And that, as you can imagine, gets very tedious very quickly. Old and exploded notions are brought up without any critical judgement—for example, the idea that Joseph Hall and John Marston indicated (by means of a very tenuous, roundabout, coded method) that Francis Bacon wrote Venus and Adonis—and the same tired, exhausted, laughable arguments are presented as if they were fresh—for example, that nothing associates Shakespeare with the works until seven years after his death. There's even this blatantly misleading statement: ". 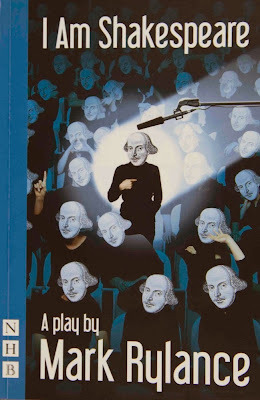 . . even his contemporary theatre managers, Henslowe and Alleyne, don't mention Shakespeare once in their diaries and account books, despite their many references to other playwrights and theatre people" (43). First, Philip Henslowe (who kept the diary— Edward Alleyn was in business with him but no diary of his survives) was not Shakespeare's theatre manager: he managed an entirely different theatre with entirely different actors and authors. While it is true that Henslowe does not mention Shakespeare, no one should expect him to! Shakespeare: The Tempest was impelled by a sea voyage that took place in 1609; Macbeth could not have been composed before the Gunpowder Plot of 1605. It's impossible that you wrote them. Oxford's first point might be significant if the facts of the shipwreck and the threat to King James I were the only reasons Shakespeare scholars give for dating those plays as they do; however, their dating depends on texts that weren't published until those dates in addition to other arguments. The second part of his argument makes no sense. First, no one is claiming that Shakespeare wrote those particular plays. Second, no one is claiming that they are mature plays. The dates Oxford gives are, at least, accurate. The anonymous King Leir—note the spelling—was written prior to 1594. It survives in a 1605 quarto. The play known as the Ur-Hamlet does not survive, but references to it come from as early as 1589. Shakespeare was twenty-five years old in 1589 and thirty in 1594, giving him plenty of time to grow facial hair (which, in any case, is not a prerequisite to the writing of good plays). 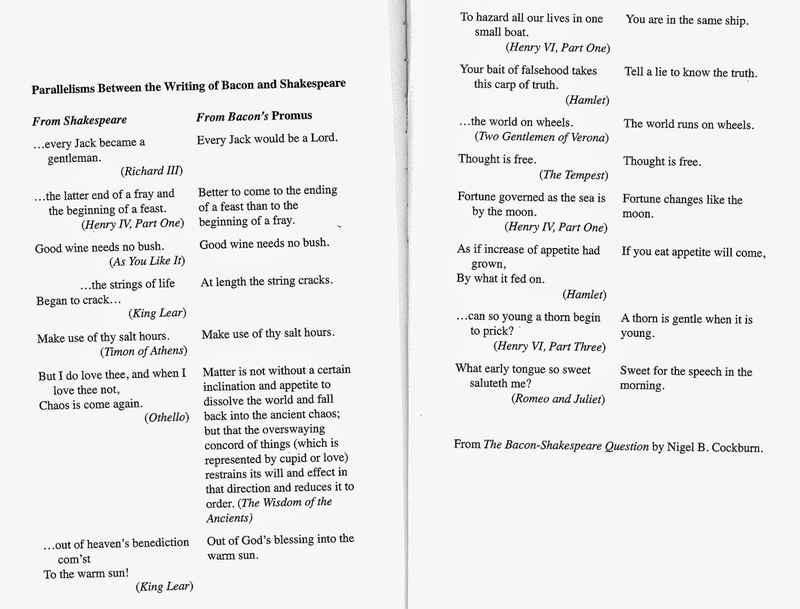 The final bit of nonsense comes in an appendix listing Shakespearean phrases and phrases from Francis Bacon side by side. The claim is that if both men said the same thing, both men must be the same men. A similar argument is often made for the authorship claims of Marlovians (for which, q.v.). Here, the list becomes even more laughable—in two distinct ways. First, many of these are common clichés of the time. If I say "A bird in the hand is worth two in the bush" and Woody Allen says "A bird in the hand is worth two in the bush," does that make us into a single entity? And if I started listing all the authors of the period who said something like "Fortune changes like the moon," we'd have a very tedious week in front of us. Second, many of these have only the very slightest commonality. Is "To hazard all our lives in one small boat" even remotely similar to "You are in the same ship"? Ridiculous! Mark Rylance may be quite a capable actor, but this misleading, propagandistic play shows him to be lacking in both honesty and scholarship.